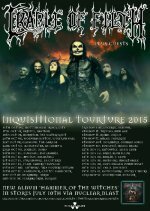 Cradle of Filth kündigen ihre Europa-Tournee im Rahmen ihres kommenden Düster-Opus, Hammer Of The Witches (ab 10. Juli über Nuclear Blast!) an. “CRADLE Of FILTH are extremely pleased to be hitting the European road in support of our latest album, »Hammer Of The Witches«, even more so now that British dates have been indelibly grafted onto the beginning! The band is sounding better than ever and are exhilarated to be starting our world tour here in England, at Rottingham Knock City nonetheless, the proverbial hub of heavy metal! We have an amazing setlist prepared already and everyone, including our infamous Crewdle Of Filth, are chomping at the bit to get out there and start levelling cities with our unique brand of raucous, Hellish music and stage production. So, long live the 'Filth and see you out there on the open field of battle!